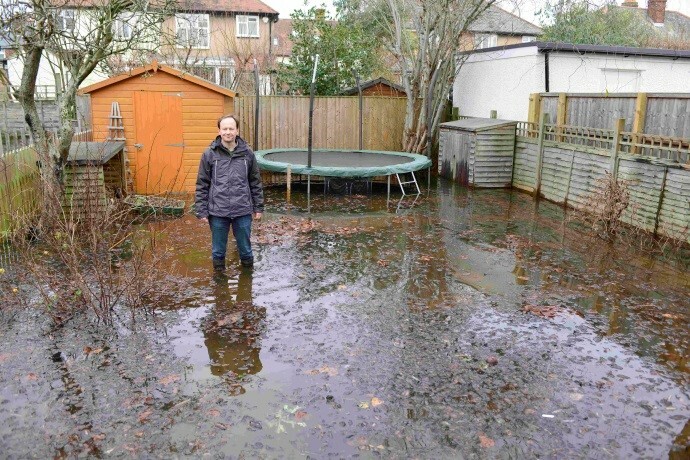 What the floods of early 2014 managed to do was to get lots of people thinking about groundwater’s role in flooding – even the Prime Minister was talking about it! When the water table rises outside of its normal range it can cause groundwater flooding. This is where the water table makes it above ground but also where it rises into basements or into sewers causing them to stop working properly. Groundwater flooding played a big part of the 2014 floods because much of high rains fell where you have permeable rocks (aquifers) at the ground surface that the rain could infiltrate into. The water table was already high in the Chalk aquifer in south England as a result of a very wet autumn and winter. This gradually filled it up near to the brim with the intense rainfall in January and February causing it to overspill in places. It took some time for the aquifer to fill but then a long time for it to get rid of the excess water through springs and streams. The flooding was often of property, roads and railway lines down-gradient of the springs and streams because proper drainage wasn’t in place – these being unusual flood events. So although our main rivers returned to their banks relatively quickly it took much longer for groundwater flooding to stop. So is groundwater flooding relevant when we’re considering flooding from intense rainfall that occurs over hours rather than weeks? This is something that the British Geological Survey (BGS), along with the University of Reading (UoR), is investigating within the SINATRA project. The water table in the Chalk aquifer is generally quite deep but there are other types of aquifer where the water table sits normally quite close to the ground surface. These are mainly where you have very permeable sediments in the floodplains of rivers. During floods, river water will help to fill the aquifer, especially where it has overbanked. But in those areas that the river flood water doesn’t reach, rainfall infiltrating directly into the aquifer could cause groundwater flooding. In these locations how quickly do we see the water table respond to rainfall and how much is required for the ground to get fully saturated? Where you get flash floods does the saturation of the ground play a role? If the water table responds very quickly, groundwater seeping into drains underground might mean they’re less efficient in getting rid of flash food waters. BGS and UoR are going to use data from an ongoing study of groundwater flooding in Oxford to investigate the role of groundwater in flooding from intense rainfall. 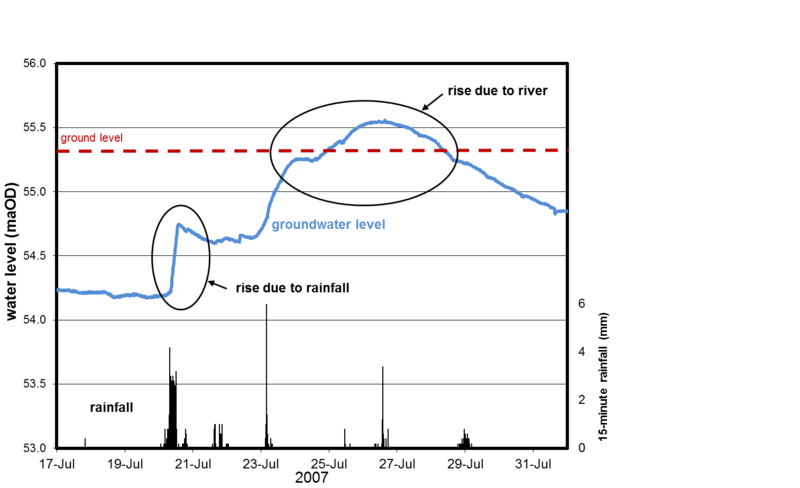 The graph shows how groundwater levels responded to the rainfall event that preceded the summer floods of 2007. The groundwater level rose by 50 cm in a matter of hours – that’s a lot when the water table is normally around a metre below the ground. The rainfall in Oxford itself wasn’t that intense – had it have been would we have seen the water table reach the ground surface quickly enough to cause immediate problems, rather than just the groundwater flooding that came later as the Thames started to gradually rise. We’ll learn from this case study and then use BGS’ national datasets of groundwater level and permeability to see whether this might be a flood mechanism that is important over many areas of the country. This entry was posted in Uncategorized on July 18, 2014 by Rob Thompson.